Thanks to everyone for a great 2018 house tour! This Fundraising Event is held rain or shine. ▪ 460 Haddon Avenue (wheelchair-accessible); Greek Revival porch. ▪ 549 Grant Avenue; American Foursquare porch. Step back a century – and before – with Proud Neighbors of Collingswood during our Porch Brunch & House Tour on Sunday, May 20, from noon to 5:30 p.m. The tour theme is “1918 to 2018 – A Century of Collingswood Architecture” and it is our annual fundraiser. This year marks the 35th anniversary of Proud Neighbors of Collingswood. The group is looking back to Collingswood 100 years ago, when five of the homes on today’s tour were witnesses to history. Imagine Collingswood in 1918. The Great War is in full force. Trains of young soldiers come through the two train stations, where volunteers give them sandwiches and tobacco. 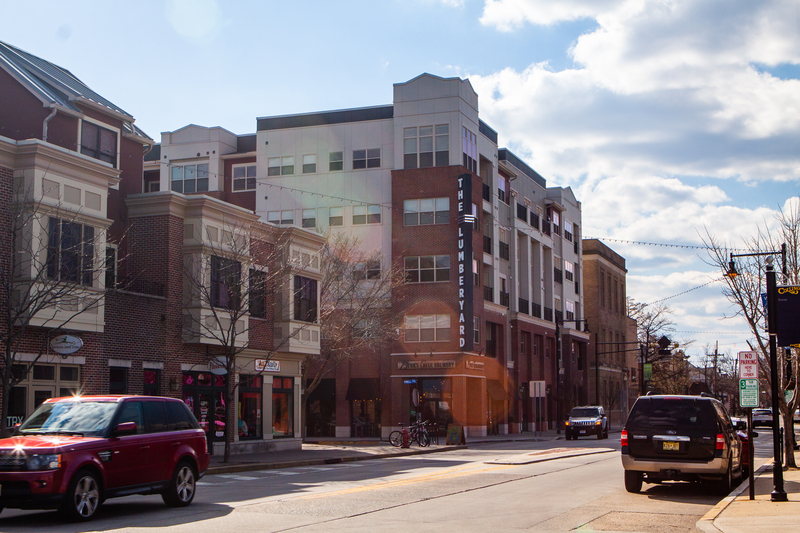 The borough is only 30 years old, yet the town fathers proclaim Collingswood the fastest-growing community east of the Mississippi river. From 1900 to 1920, Collingswood’s population would grow from 1,663 to 9,000. Soldiers returning from World War I, their families, and the generations that followed would build the homes we now treasure. Of course, settlement of Collingswood was well in place prior to 1918. The Newton Colony was settled in 1682, and Collingswood was established in 1888. One of the Borough’s original homes, the 1707 Stokes-Lee House, is on the tour this year. In 1987, that house was added to the National Register of Historic Places. Proud Neighbors of Collingswood is glad to show a diversity of well-maintained architectural home styles of yesteryear and recent years. The newest “home” on the tour is a 2014 apartment at The Collings at the Lumberyard! Through events such as the Porch Brunch & House Tour, and by supporting preservation activities in Collingswood, Proud Neighbors encourages everyone to respect the irreplaceable architectural treasures in their communities. Start your day with homemade brunch served on two historic porches. Enjoy a savory strata served with homemade muffins, breads, coffee/tea/iced tea and dessert. Brunch will be offered by reserved seatings at 11 a.m. or 1 p.m. Advance reservations are required for brunch. Combination brunch and tour tickets are $30. Call 609-238-5407 for brunch reservations. Tour-only tickets are available in advance for $18. Tour tickets are sold at the Collingswood Farmers’ Market every Saturday morning, Tuesday through Sunday at Bauhaus Hair Design Studio, daily at Grooveground, and weekdays at Collingswood Borough Hall. Day-of-Tour tickets will be sold at Grooveground . We invite you to discover Collingswood’s diverse homes on this year’s brunch and tour. As you enjoy your day, be inspired by the craftsmanship, past and present, that is on display in the homes of Collingswood. Many tour guests make this an annual tradition, as it is always held the Sunday after Mother’s Day. Won’t you join them? Built in the Queen Anne Revival Farmhouse architectural style, which marries the business of agricultural pursuits with the whimsy of ornamentation, this home first appears on the Sanborn Fire Insurance Map in 1909, when a home furnished with electricity was a novelty. As in any utilitarian endeavor, form follows function, so the home has a big front and side porch for muddy workboots and multiple entry doors letting on to formal front rooms for entertaining. Back rooms were planned for cooking, drying and canning. It is still a full half-acre, triple lot and the house is attired in the understated decorative Queen Anne Revival woodwork, shingles, clapboards, turned railing, molding and millwork. Before the devastating Chestnut Blight of the early 1900s, it is estimated that nearly one out of every four American hardwood trees was a chestnut, so it’s notable that the home’s original interior chestnut trim remains. 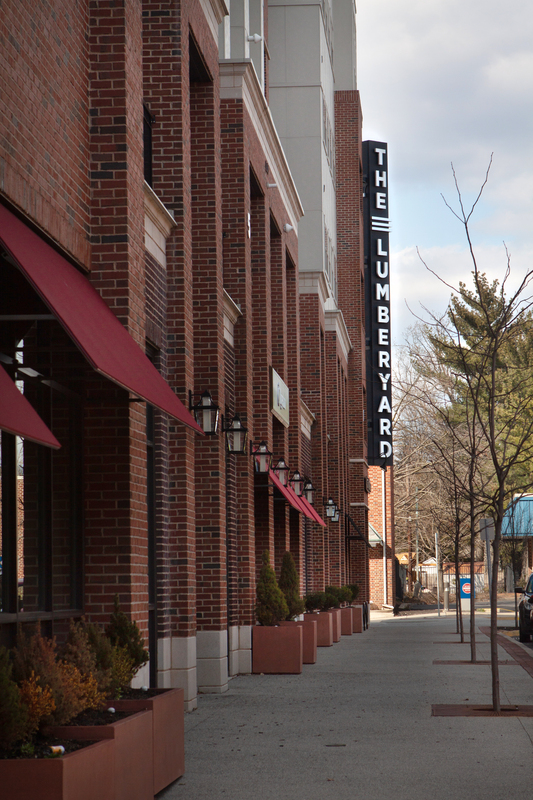 The Collings at the Lumberyard was completed in the fall of 2014 and sits in the heart of Collingswood’s restaurant and shopping district. 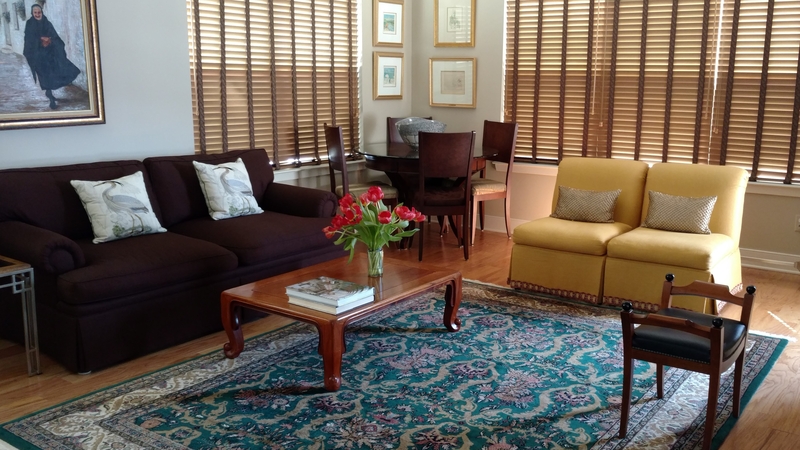 This unit is the current residence of Rosa J Cucchia, owner of RCI Interiors LLC, an interior design firm specializing in residential interior design, including kitchen and bathroom renovation and design. As you enter the modern apartment, stop to admire the Biedermeier curio cabinet in the entryway. It is filled with memorabilia from Ms. Cucchia’s many travels. The walls in the entry hallway are lined with artwork that continues throughout the apartment and reflects the eclectic tastes of the occupant. Many items were chosen during visits to artists’ communities in Europe, Southeast Asia, Central America, Cuba and other destinations. Listed on the National Register of Historic Places, as well as New Jersey and Collingswood Historic Registers, this 1910 home was originally built for B.B. Draper, who was treasurer of the Broadway Trust Company in Camden. His 20th century neighbor was prominent citizen Judge John B. Kates. The 1912 tax book assessed 436 W. Collings at the same value as the judge’s property. This 2 ½ story Center Hall Federal Revival-style house has a coursed rubblestone porch, and restored built-in gutters that permit full view of its stately exterior. The façade is graced with a paneled door with leaded glass sidelights and semicircular portico supported on large brackets. Historic 8/12 double-hung sashes with paneled shutters are on the first floor, 8/8 double-hung with louvered shutters are on the second, all with wood sills. Before entering the home, gaze up at the molded arched surround and keystone in a dormer. Notice the box cornice with modillion and the slate shingled roof. These new owners have devoted more than a year redesigning the interior of this historic property. They worked closely with architect Tom Wagner, who designed the present layout with the intention of updating this 108-year-old house to include additional family gathering areas and 21st century amenities. The thoughtful new owners retained the original beautiful staircase, moldings, hardwood flooring, and the glass doorknobs throughout the house. This pristine 1918 American Foursquare was once the home of Herb and Mildred Belins, a genteel elderly couple who lived here for decades. It languished on the rental market for three years, as potential buyers complained of only one bathroom. Few appreciated the detailed woodwork, an original layout, finished third floor, and an expansive backyard saturated in natural light. The current owners have an appreciation for this home’s historic architectural value. Mike and Amanda transformed it with simple cosmetic changes — new cohesive paint schemes, refinishing existing hardwood floors and carrying new hardwoods seamlessly into the kitchen. Now this home honors the history of those who owned it and highlights every rich detail. Original doors, knobs, a beautiful stairwell and graceful arches accent the rooms. The vintage kitchen has ample space for Amanda, a trained pastry chef. The new owners have turned 926 Stokes into the perfect example of an old house living to its utmost capacity in modern times, which is exactly what Collingswood is about. Walking up the curved brick and slate walk lined with Belgian block pavers, one can only be inspired by the quaintness and charm of the circa 1930 pre-war Tudor Revival home. The stucco façade accents its distinguishing character. Brickwork on the front steps and exterior chimney, as well as the hearth inside, is accented with art tiles original to the house. Heading up the walk to the arched top entrance, the door resembles a medieval fortress made of rough-hewn wood. Rumor is that lumber from a single tree was used to make this English Oak front door. Listed on National Register of Historic Places, as well as New Jersey and Collingswood Historic Registers, this is a five-bay, 2-1/2 story stucco-on-brick Georgian center hall farmhouse built in two stages. Sheathed in stucco, the front, or east, façade features a molded brick watertable, tooled stone belt course, molded box cornice, central entrance portico with Roman Doric columns, vaulted soffit, matching molded box cornice, integral benches, and single-leaf sash entrance door with a stained glass fanlight. A historic photograph taken circa 1900 shows the south and rear elevations with six-over-six sash windows. Unfortunately, the wood sash windows were replaced. Both gable-end elevations are dominated by double-breasted chimneys. The south gable end features a recessed semi-circular arch at the third floor level into which are struck the dates “1761” and “1907.” The latter is the date of a major remodeling, from which the dormers and stucco dates. A vintage photograph hints of the 1761 construction date of the southern half of the house. The west elevation faces Newton Creek and is believed to have been the front of the original house, which comprised the two northern bays and was constructed in 1707. Three later one-over-one sash gabled dormers punctuate the roof plane. Five bays in width, the façade is dominated by an enclosed Tudor Revival porch, added after the house was stuccoed, probably in 1923. The youngster in the neighborhood, this 20-year-old residence was built by a Jersey shore builder. As you approach this home, you realize the property slopes up and a welcoming open front porch looks down on picturesque Newton Lake. A porch swing, mahogany floor, and ceiling fan complete the invitation to sit awhile. Upon entering the home you see a respect for the hallowed ground upon which it was erected. This building lot was carved from land on the lake side of the circa 1707 historic Stokes-Lee property, now standing at the rear. The interior complements the character with plantation shutters, chair rail and a color scheme, tied beautifully with the current owners’ personal furnishings. This stunning executive home, a rare find in Collingswood built in the 1930s, bestows a magnificent presence on its 1.18 acre lot. This serene paradise has gently rolling hills, a winding brook, plus a tennis court, in-ground swimming pool with a waterfall, and a gazebo that complements this outdoor retreat. Oak floors with walnut inlay, sun room, and a gas fireplace in a spacious living room add charm to this cozy place. The home boasts an amazing kitchen with granite counter tops, wine fridge, bar, island sink, pot filler at the stove and an abundance of cabinets … a chef’s dream! The home preserves its historic elegance inside and out while being blessed with a new kitchen with a tranquil vista. Listed on the National Register of Historic Places, as well as New Jersey and Collingswood Historic Registers, this Caretaker’s House is nestled within the 70-acre jewel of Knight Park. A destination on any house tour, its location assures interesting details not found anywhere else. Among the perfect setting of mature trees, open fields, playgrounds and athletic fields, this Knight Park House is an 1887 example of compact elegance, Folk Victorian. Just step inside this house to see the progress that caretaker George Leary has made on the interior restorations. George re-hung pocket doors, fabricated stair tread edge molding, reinstalled stairwell spindles, and creatively exposed original cedar wood siding inside the house on the kitchen walls. Notice metal pipe racks installed recently for kitchen storage. George also accented his dining room with his custom-built wooden trestle table. Courtesy Request: Proud Neighbors appreciates your visit and consideration for the privacy of homeowners. Please do not wear heels inside tour homes as heels may cause damage of floors. Thank you. Four of certified gardens are open during Proud Neighbors Porch Brunch, House, and Garden Tour. The different gardens, including the Community Garden, demonstrate that beautiful and functional gardens can also be habitat gardens that attract butterflies, bird, pollinators, and other wildlife. Proud Neighbors 2018 fundraising event attempts to encourage awareness and protection of town treasures for future generations. Booklets with house descriptions are distributed at the event. Spread the word to celebrate our community’s treasures and hidden gems! All proceeds from Proud Neighbors of Collingswood’s Porch Brunch & House Tour are donated back to the community to encourage historic preservation, with emphasis on maintaining the historic character of Collingswood. Come discover the history, charm, and style that exist behind the doors of Collingswood homes. Restrooms: Noon – 4pm at Collingswood Library, 771 Haddon Avenue.